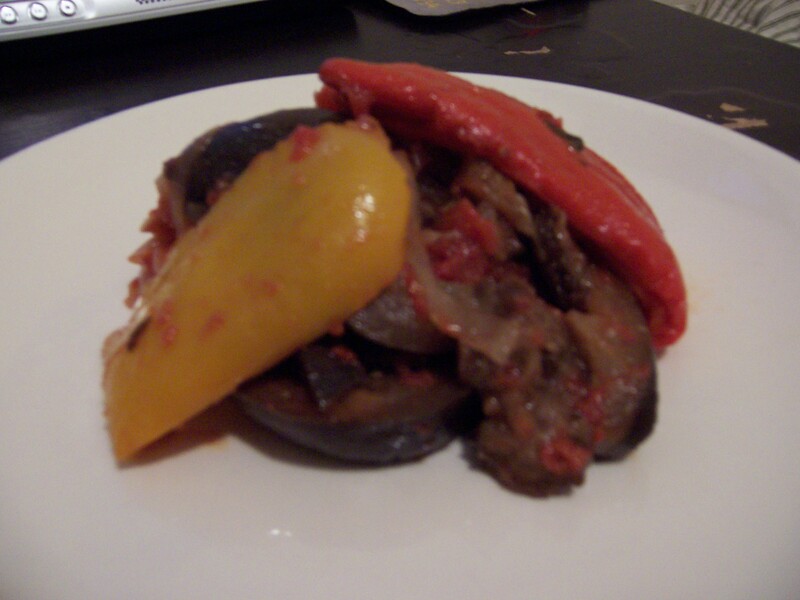 Ratatouille (or Tian of Vegetables, as it is also known) is the very fancy-sounding name for a very rustic Provencal dish. It is, in essence, a bunch of summer vegetables stewed together in the oven. Ratatouille is a great dish for entertaining because it can be prepared ahead of time in vast quantities and simply slapped in the oven when your guests arrive or it can even be cooked in advance and served at room temperature. Sitting for a day actually concentrates the flavors and improves the ratatouille, and you can drink wine and hang out at your party instead of sweating in the kitchen while your friends eat all your cheese. So go make some ratatouille, and stay tuned for a pretty clever plan for some of the leftovers, if I do say so myself, and I do. Recipe after the jump. 1. Basically, cut everything up and throw it in a pan, but if you are feeling fancy, slice all the vegetables thinly and stack in layers. This level of fussiness is not for me, but if that’s your kind of thing, go for it. 2. Whether you go the fancy route or not, I recommend studding the garlic cloves in whole and unpeeled throughout. People can eat them or not as they choose. 3. Either way, mix in fresh herbs and salt and pepper in each layer. 4. Bake at 350 for about an hour or until all the vegetables are tender. 5. Serve to friends and ask them kindly not to mention the damn movie. It’s a very good movie, but you’ve heard that joke before, thank you very much. websites I stumbleupon every day. It’s always interesting to read content from other writers and use something from other web sites. It’s very straightforward to find out any topic on net as compared to books, as I found this piece of writing at this site. I’ll immediately grab your rss as I can not in finding your email subscription link or newsletter service. Do you’ve any?